After 30 years, "People Greeters" will no longer welcome Walmart customers with a "cart and a smile." 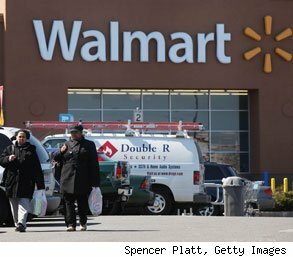 Four months after Walmart got rid of its night-shift "People Greeters," the big-box retailer is moving its day-shift greeters inside the store. Walmart claims it's all in the name of better customer service, but the announcement has left some greeters uncertain about the future of their jobs. Jerome Allen has greeted morning shoppers at Walmart for five years, the last two at a supercenter in Fort Worth, Texas. He heard through the grapevine that the store was reassigning its night-shift greeters, but was surprised when the store manager called him into his office on Thursday, and told him that there would be no more door greeters at all. Allen's new position, which begins Feb. 6, will be to stand in "high traffic" areas of the store, ask customers if they need any assistance, and direct the flow of traffic. Allen doesn't think his new position will be particularly useful. The store, he said, already has a full roster of employees manning the floor, who are required to ask nearby customers if they need any help, as dictated by the "10-foot Rule." David Tovar, a Walmart spokesman, claims store greeters have no cause for concern. "They're not going anywhere," he told AOL Jobs in an interview. But Allen isn't convinced. "I don't think they're going to let me stand around doing nothing," he said. "I don't know what my career is going to be here at Walmart. They're moving me to a position that isn't going to be here very long." Allen fears that many greeters, once they're in their new positions, will be found redundant, and let go. Allen's hours are already reduced for next week, to 16 hours from 20. He would love to work more; with an hourly wage of $10.45, Allen is struggling to support his two children. After Walmart got rid of night-shift greeters in September, Tovar told Bloomberg that the decision was a way to to rein in costs and prices. Walmart's sales have thinned in recent years, as many customers flocked to dollar stores instead, which offered even lower prices. Same-store sales at Walmart dropped for nine straight quarters, but picked up by 1.3 percent in the quarter that ended in October. In contrast, between 2007 and 2010, Family Dollar and Dollar General grew by 15 percent and 37 percent, respectively, according to a December report from Colliers International. Most of the night-shift greeters were assigned to other roles, "and a very small percentage ended up leaving the company," said Tovar. But that's not what's happening here, he emphasized. Walmart had given greeters extra responsibilities over the years, he explained, like helping customers return products, and cleaning and prepping carts. The change frees greeters from these other duties, so that they can "really focus on customer service," he said, and interact more with customers while they're in the store. Analysts doubt the move will have any real impact on sales, but say it does raise questions about the future of Walmart's smiley-faced image. "The Walmart greeter put a friendly face on the big box, self-service store," said Wendy Liebmann, CEO and chief shopper of consulting firm WSL Strategic Retail. "More than ever, shoppers are looking for an engaging experience at retail. Especially in this new digital world. It's not only about the lowest price. Hopefully Walmart understands this, and will find a new way to deliver it." The "People Greeter" was an idea dreamed up by Sam Walton himself, first introduced in 1980, and quickly imitated by retailers everywhere. The "People Greeter" has become such a cultural staple that he even had his own cameo on "Family Guy." Walton believed "aggressive hospitality" would set Walmart apart from other retailers, and Tovar insists that this new development is simply a continuation of that legacy. Even so, "Welcome to Walmart" isn't quite the same, when said in a "high traffic" area. -- Barbara Thau contributed reporting to this article.